Music Ministry at OAPC connects with the vision/mission of Oakland Avenue Presbyterian Church to Love God and Love Neighbor. 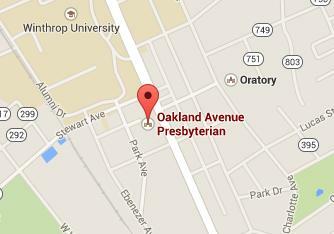 Oakland Avenue Presbyterian Church offers a multi-faceted music program, with opportunities for persons of ALL ages, interests and abilities. Multiple singing, handbells, and instrumental ensembles regularly contribute to the ministry of the church. musician or not, have children, or are just interested in exploring your potential, we invite you to join us in "making a joyful noise unto the Lord". Whatever your level of interest or ability, please take time to acquaint yourself with what OAPC offers, and review the Music Ministry Brochure for additional information and a personal contact. Wednesdays 6-6:45 p.m. - Sept - April - This choir introduces children to singing and musical skills, and prepares them to be lifelong participants in worship. Singing, music, hymn learning, bible stories, and worship skills are taught through a variety of games and activities. Process, not product, is the aim. Children grow in their understanding of vocal and musical skills, singing, hymnody, Bible, Psalms, and worship leadership skills through music. Regular participation in worship, and working together as a team is very important. Both the Joyful Praise and the Covenant Choir programs are part of Together on Wednesdays at OAPC. This choir is challenged to greater service through more regular worship involvement. Ministry to others is emphasized, and outreach to others through multi-state tours and local mission projects. They also join with other youth choirs from around the country for local and regional choir festivals. Members grow in their understanding of music, singing in multiple parts, using good vocal technique and choral tone. Adults - Tim Moe, Director. Wednesdays 7:30-9:00. Ongoing, with a break during July. prepare and perform the best choral music in a wide a variety of styles and traditions, as well as performing larger choral works with instrumentalists. Membership is open to all, regardless of experience, upon interview with the director. This instrumental ensemble is open to all band and orchestra instrumentalists. There are small and large ensemble opportunities. The Consort participates in regular and special worship services during the year, providing preludes, offertories, and accompaniments for hymns and/or anthems.